Global smartphone brand Vivo has released another powerful addition to its growing family, the Vivo Y95, that comes with the maker’s thumbprint specs - a 6.22-inch Halo FullView™ Display for an expansive view and a 20-megapixel front camera for clearer selfies. But what’s great about the new release is its higher capacity battery and other features that make every Y95 one of the bests of its league. The Vivo Y95 is equipped with the all-new 6.22-inch Halo FullView™ Display with a maximized screen-to-body ratio of 88.6%. The front camera sensor’s place holder in the top middle of the smartphone evokes the halo of a rising sun. It is part of the brand’s efforts to provide a more expansive mobile viewing experience to its every patron. It also provides 1520 x 720 HD+ resolution that ensures vibrant colors and clarity on screen. Vivo Y95’s 20MP front camera allows it to capture more details to render clearer selfies. Just like most Vivo smartphones, the Y95 is also equipped with artificial intelligence technology such as AI Face Beauty and AI Selfie Lighting that detect age, gender, skin tone, skin texture, and lighting environment to accurately enhance features. The new smartphone also comes with a double rear camera with 13MP main rear camera and a 2MP secondary rear camera. The Y95’s double rear camera captures depth-of-field information to recreate professional-grade bokeh shots effortlessly. Thanks to AI technology, the smartphone can also intelligently identify 140 different photo scenes to automatically optimize every shot to deliver richer blue skies or livelier flowers. Even without third-party apps, the Y95 can add fun to any photo with its own range of fun, unique stickers that are enhanced with AR technology. The Y95 is equipped with higher capacity battery to ensure longer performance. Its 4030mAh battery is complemented by an exclusive, smart-energy power management system that allows users to play at will without running out of battery. This is further enhanced with the Vivo’s smartphone’s 4GB RAM and Qualcomm Snapdragon 439 octa-core processor with a 12nm design so users can run multiple apps with ease. Moreover, the Vivo Y95 has 64GB of internal storage so users can download as many apps and files as possible. The Vivo Y95 has an updated AI Game Mode that improves functions such as Floating Call Alerts, Background Calls, and the Game Keyboard. But it also added features such as the new Game Assistant. A quick sideways swipe gives users easy access to all these functions, so they can choose what to turn on or off without leaving the game. In addition, the all-new Auto Gaming Mode can keep games running in the background that turns the screen black while opening other apps so game progress will always be saved. The Y95 has the capabilities to understand what every user needs through its Jovi AI. It can count daily steps and calories, tell the results of sports games, provide updates on weather conditions, and prompt users to take a rest if working late into the night. Vivo Y95 allows users to enjoy two worlds at the same time with its Split Screen feature. A simple, three-fingered swipe splits the screen in two, enabling users to chat with friends while simultaneously watching videos. It currently supports video streaming, Facebook, Line, Messages, Viber, WeChat, WhatsApp, BBM, Play Movies & TV, YouTube, Video, MX Player, VLC for Android, Google Map, WPS Office, Microsoft Word, Microsoft Excel, Chrome, Gmail, and more. In collaboration with Google, Vivo Y95’s camera has been integrated with Google Lens technology to bring AI image recognition. Using an industry-leading deep learning algorithm, combined with neural network technology, the Y95 can identify objects and scenes in photos taken and perform related searches. 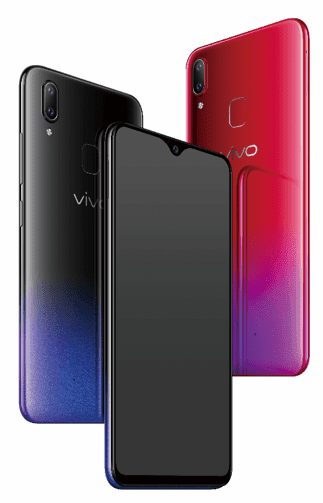 The Vivo Y95 is available in Starry Black and Aurora Red. The Starry Black model adopts a whole new gloss painting process on the back that perfectly blends a deep black and shimmering blue, along with the beautifully pale purple visible when viewed from certain angles. Enjoy the powerful specs of the Vivo Y95 for only Php13,999. It is available in all Vivo stores and kiosks nationwide. Don’t have time to pick up the model yourself? Get the new Y95 through Vivo’s official online store on Lazada and Shopee.